Date of lunch : june 2008. Pour une critique en français très détaillée, rendez-vous sur le site de cuisiner en ligne, je suis 100% d’accord avec ses commentaires et en plus, nous avons dégusté quasiment la même chose ! A ce propos, les photos m'ont été aimablement prêtées par Stéphane, car mari à moi pas content quand moi "mitrailler" endroits chics !! Réservation indispensable (au moins 15 jours à l’avance pour le déjeuner, 2 mois pour le dîner ou le brunch dominical). 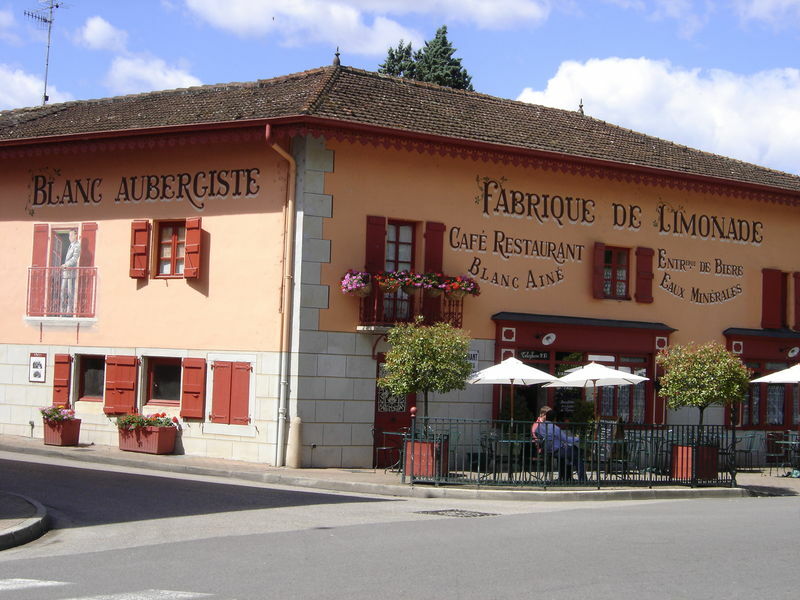 Jean-François Piège comes from the Drome region, in the southeastern part of France.His first restaurant position was at the restaurant Chabichou, in the French Alps resort, Courchevel. Later he worked at Chateau Eza on the French Riviera, under Bruno Cirino. 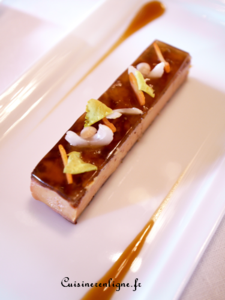 After a stint in the kitchens of the French presidential palace during his military service, Jean-Francois Piege again joined forces with Bruno Cirino at Les Elysées, the restaurant of the Hotel Vernet. 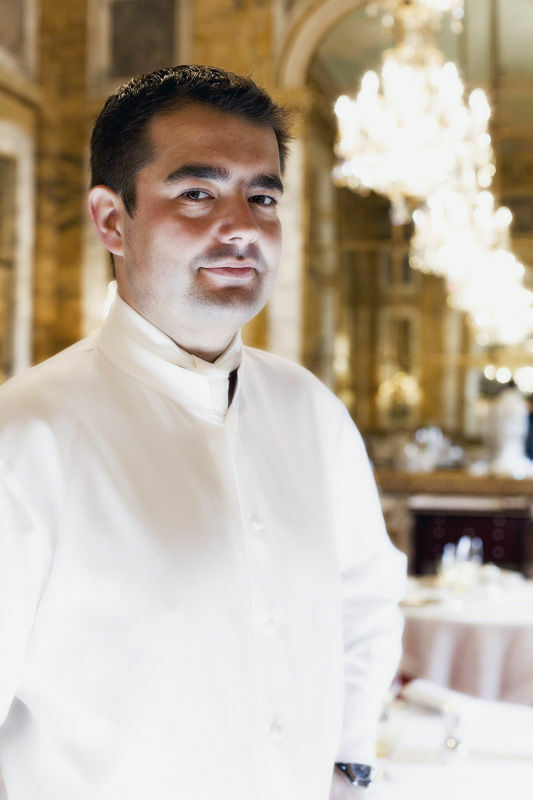 Then, at the famed Louis XV in Monte Carlo, he entered the world of Alain Ducasse in 1992.Chef Piege’s passion for excellence made him the natural choice when Alain Ducasse needed someone to take over at the Plaza Athenee in 2000. Jean-François Piège was only 34 when he came to Les Ambassadeurs in February 2004 to become Head Chef. A side note about the pictures : The pictures on this reviews are not mine, they were taken by Stéphane, a Chef and foodblogger (you can see his site, “cuisiner en ligne” here and his review (in french) here) who had lunch at “Les Ambassadeurs” a month ago and he gave me permission to use his pictures, to give you an idea of the beauty of the dishes. As the menu has very little changed since his lunch, they were totally appropriate for my very own review. For lunch on week days, you can choose between a tasting menu (210 euros), the business menu (three courses, 88 euros, wine and coffee not included) or "à la carte" selection. We chose the business menu for obvious reasons, and we also noticed that all the items were also on the “à la carte” but much more expensive. For instance, my main dish alone was 70 euros à la carte!! In the business menu, you have the choice between two starters (one with seafood, one with meat), two main dishes (seafood/meat) and two desserts. This is more than enough. We managed to taste everything as we chose different items from starter to dessert ! 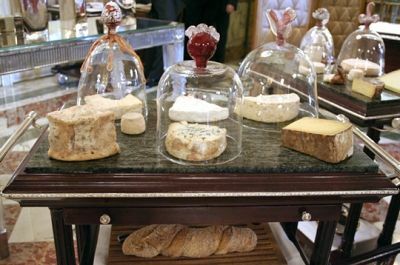 Before starting, one is served a selection of 3 different individual breads, and two butters : a salted one made by Jean-Yves Bordier, one of the most famous cheese artisan in France. His world-known shop is located in Saint-Malo, Brittany. And an unsalted one, “a beurre de baratte” (freshly churned butter). As an amuse-bouche, we had one of Piege’s famous dish : like a “Plateau TV” (his very own interpretation of TV platter, served on a tray) : 5 items to be eaten in a certain order, from left to right : two shots glasses, one filled with celery lemonade and vodka, the other one with crayfish sauce and a foie gras (duck liver) foam. In the center of the platter, a tiny ball (named here a “cromesquis”, never heard that word before) in a tiny bowl (haha) which was a round crunchy croquette filled with a liquid crayfish sauce. Fourth item was a thin cigarette-like tube made with brick pastry and filled with “niçoise” cream (basil, cream and probably anchovies and bellpeppers). Last was butter with black truffle bites, wrapped like a candy. Needless to say that this amuse-bouche was incredible, with a wide variety of sensations and tastes. As a starter, my husband chose the “Foie gras de canard des landes, en gelée Montmorency et en spaghetti cerises/amandes” (duck foie gras from Les Landes, served in two plates : one cold with a jelly of “Montmorency” cherries and the other served warm with almonds and cherries in the shape of spaghetti pasta). I took “araignée de mer decortiquée, en salade et vinaigre fumé et en bouillon au satay” (shelled spider crab, both ways : cold with smoked vinegar and warm with a satay broth). It was served with very fresh sushi-like granny apples. Both main dishes showcased contrasts in textures, temperatures and taste. I have no word to describe the sensationalness (does that word exist ? If not, well, it should!) of the dishes. Like in many high-end restaurants, the portions are small but believe me, it was more than enough. At this point, I was almost full (I said “almost”, lol). Main dishes : Ah, I had ris de veau de lait blanc/brun au gout d’une pissaladière (veal sweetbreads with an accompaniment which tasted like a Provencal pizza). Sweetbreads are something I often choose in restaurants as I am totally unable to make them at home. They were served with the best onion and potato purée I have ever tasted. 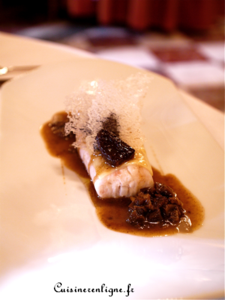 A.chose “Bar de Ligne piqué au vin jaune, morilles/riz au comté” (seabass with yellow wine, morels and rice with comté cheese) : the seabass was “swimming” in a yellow wine sabayon sauce, simply topped with melted comté, and with an asian-style rice tuile.Still a lot of contrasts between crunchy and soft textures and all tastes were amazing, extremely well-balanced. The presentation of the dishes is very modern, almost architectural, very zen-like. Cheese : Two carts full of affineur cheeses arrived to our table, each cheese under its own glass “cloche” . The cheese came from Antony, another famous cheese shop. I chose a comté, a pont l’évêque and …can’t remember the third one ! Desserts : oh.my.God !! Spectacular. 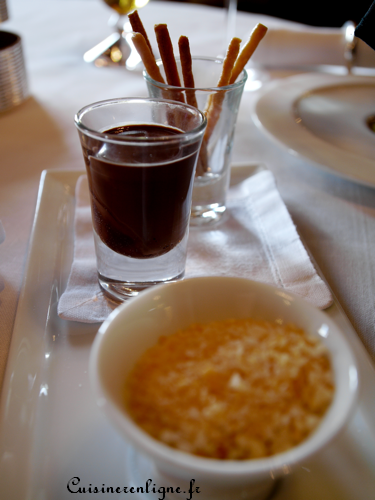 But before the desserts, we had so many amuse-bouches that I can hardly remember all of them. 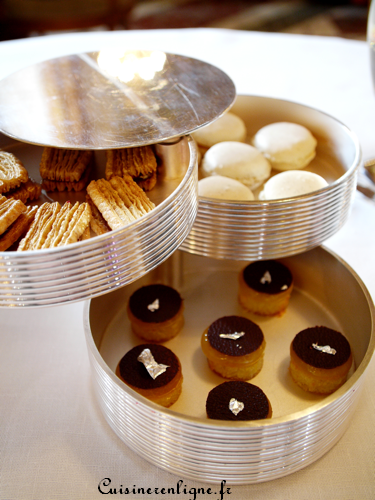 First, a silver “tower” with three floors, each displaying miniature size sweet bites : pineapple macarons, rhubarb pastries and mini pims (chocolate and orange). 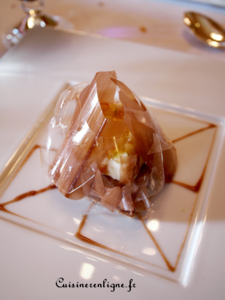 Then a “S” shaped tray with triangular chocolate and hazelnuts ganache and two bite-size crèmes brûlées wrapped in plastic film, that we were told to crush in our mouths before removing the film. Followed by a Malibu and coconut Eskimo ice-cream coated with chocolate. And last but not least, a tray with a very funny sparkling sugar, some pastry sticks and a caramel sauce. We were asked to soak the sticks in the caramel first then coat them with sparkling sugar, which made an hilarious sensation in our mouths. Can you believe these were not even the desserts ?? My dessert : a cylindrically-shaped strawberry sorbet with rhubarb center surrounded by a meringue cage. 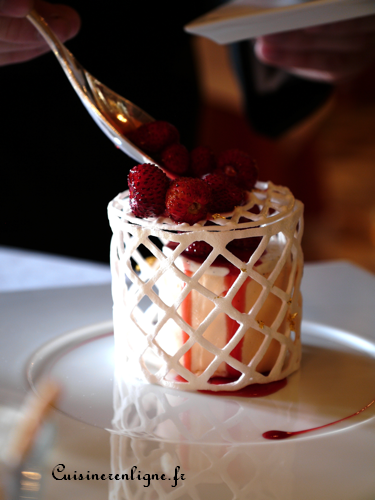 A generous scoop of fraises des bois was added at the table. The cage was decorated with gold leaf flakes. Gorgeous.Excellent.Fresh. Hubby had a chocolate/banana dessert wrapped with thin leaves of sugar, just like a gift. It was beautiful, crunchy and airy at the same time (yes, I know, hard to imagine, but that’s the way it was). 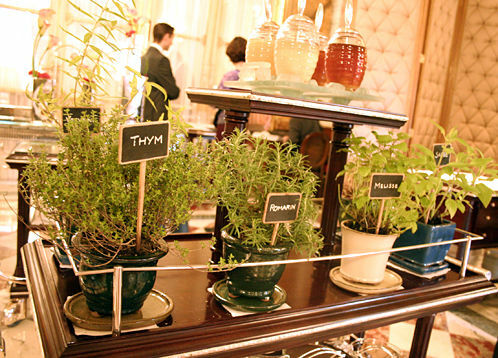 We ordered a coffee (large selection) , but if you prefer tea or herbal infusion, you will be impressed by the cart with fresh herbs in their pots and cut in front of you. After coffee, we were served a chocolate and frozen mint bonbon. A glass of Rosé Roederer Champagne to start for both of us and a glass of white wine for hubby. I stayed with water for the rest of the lunch. We are not really wine connoisseurs, but if you are, you won’t be disappointed : the wine menu is the most extensive I have ever seen : it is literally several meters long, folded like an accordion. Maybe my only little disappointment. I found the room to be extremely elegant but cold : too many space between tables, which is great for intimacy but lacks of coziness. And the marble everywhere did not help to heat atmosphere. The room is large, with only a dozen tables. Also, many reviews mention the view on the Place de la Concorde, but actually there is no view. First, only half the tables are close to a window, and secondly, only one of them has an unobstructed view on the outside. The customers were mostly French, and businessmen, apart from two other couples. The table decoration was quite sober, but the silverware (Christofle), and plates (Bernardaud) were wonderful : modern and classy. We had at least 4 people taking care of us, but they were not too formal. We could chat and joke with them. They were quite young, but professional. 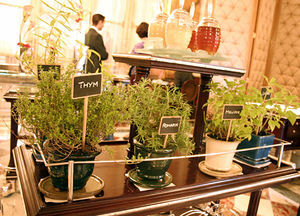 The perfect restaurant for a very special occasion. 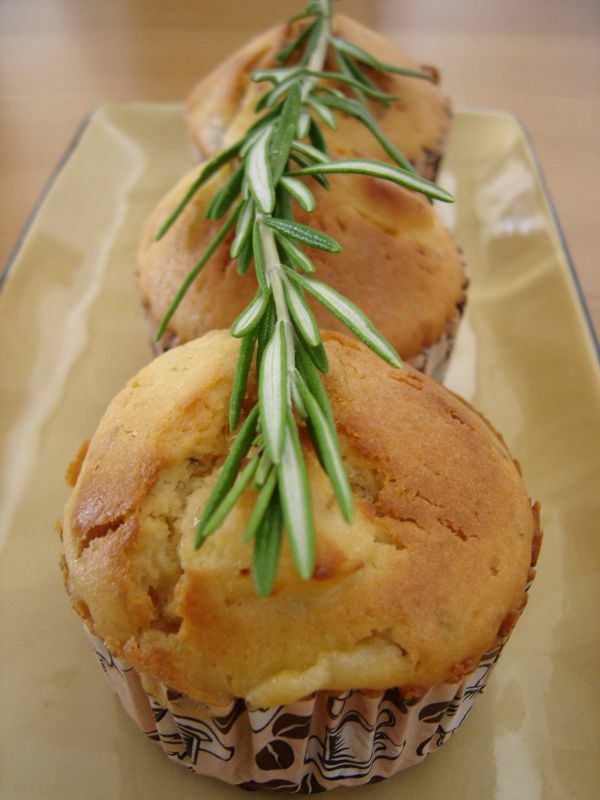 The lunch menu is really a bargain for what you get and is an opportunity not to be missed to enter the world of Haute Gastronomie. Commentaires sur Un Piège merveilleux aux Ambassadeurs/A wonderful Piège (trap in french) at Les Ambassadeurs. Je rêve d'aller dans ce restaurant! 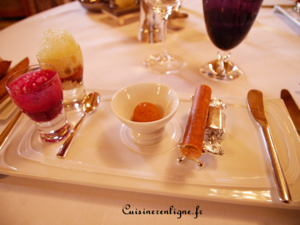 Ce repas m'a l'air superbe et la décoration des plats magnifique. Je me suis permise de mettre un lien vers ton blog. Amitiés. je n'avais pas du tout aimé le brunch au Crillon qui n'était pas à la hauteur du lieu. cependant JF Piège est un cuisinier exceptionnel et j'y retournerai volontiers pour gouter à tous ces plats que tu viens de nous faire découvrir. merci pour cette luxueuse ballade. 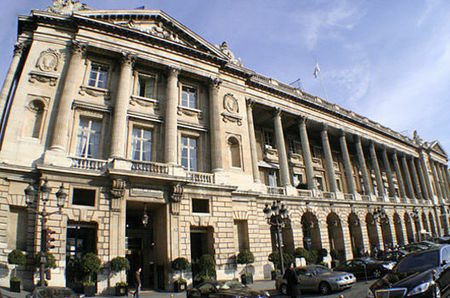 Une question peut on savoir ce que l'on attend d'un brunch a la hauteur du Crillon? Et vous vous basez sur quels criteres de comparaison?